If I had to choose one thing that completely and totally makes me so happy, it would have to weekend getaways. There's something about getting away from the norm, taking time to relax + explore that rejuvenates me in every way. Tomorrow, John and I will celebrate FIVE years of marriage, so taking off on a romantic, weekend getaway together is the perfect way to celebrate. One thing you guys may not know about me is that I'm a huge country music fan. Always have been, always will be. My friend Leslie and I spontaneously took off to Nashville last year around this time to be extras on the show, Nashville, and we had the BEST time. It's the perfect time of year to head to the mountains, see the leaves change and explore the city in the cool, crisp air. Nashville, here we come! I hope you all have a lovely weekend and as always, thanks so much for stopping by, x. We're headed to Nashville next weekend and I can't wait, I've never been before! I'd love to see a recap of your trip after you get back. I love Nashville SO much! Have a blast and happy anniversary! Enjoy! Congratulations on the five years of marriage! I hope there are many more to come :) Enjoy Nashville! http://www.comfortably-chic.com --- hosting my first giveaway on the blog today! Have fun Meg! Happy Anniversary to you and John! Have fun on your trip! 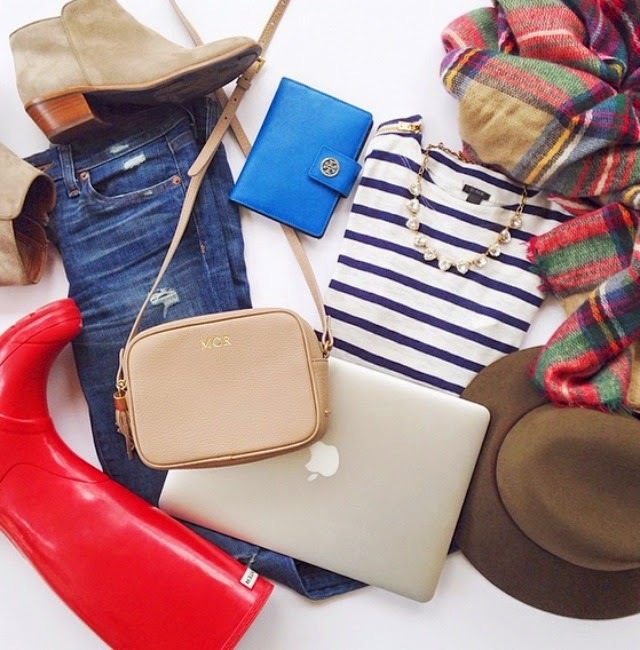 Love the essentials you packed with you! happy anniversary! i love the pairing of stripes with that plaid blanket scarf.